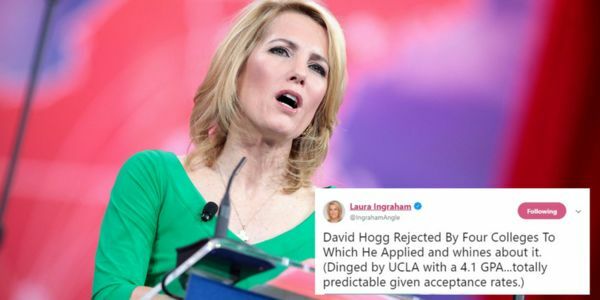 Conservative Fox News host Laura Ingraham is no stranger to controversy and hateful rhetoric, but she took it too far when she posted a bullying tweet about Parkland shooting survivor David Hogg — mocking the high school senior for not getting into several colleges he had applied to. David Hogg is a teenager — a brave activist, who is still recovering from the horrific February 14 mass murder of his friends and classmates. Laura Ingraham is adult who purposefully tweeted her cruel taunt at a young gun violence survivor in a ploy for ratings. Her behavior shows more than poor judgement — and her show, the Ingraham Angle, should be pulled from air. Ingraham has since apologized, but only after massive public outrage over her actions — including more than 10 advertisers like Hulu, Rachael Ray's Nutrish, TripAdvisor, Expedia, and Johnson & Johnson pulled all advertising from her show. Hogg has, rightfully, not accepted her apology and instead called on her and other Fox News hosts to "denounce the way your network has treated my friends and I in this fight." And he's right. Ingraham and her NRA-backed colleagues have consistently and purposefully targeted Parkland student activists — teenagers fighting for the safety of children — with distain, mockery, and outright lies. Enough is enough! Please sign our petition calling on Fox News to pull Laura Ingraham from air!